Once upon a time the boy mentality (I phrase it this way because I played with many a tomboy in my younger days) had a fair sized footprint in Fantasyland. At one end Peter Pan took to the skies of Never Never Land, as he still does, while the other extreme of Fantasyland featured the adventures of Mr. Toad and Captain Nemo. These days, the last bastion of boyhood resides squarely on the shoulders of the boy who never grew up, or does it? 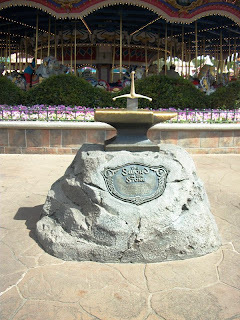 Though the ceremony was discontinued in 2006, the stone remains. For the little boy in all of us, and we do indeed each have that side to us, there is a pit stop to be made in Fantasyland beyond Peter Pan’s Flight. If nothing else, an attempt to pull the sword from the stone makes for a great photo opportunity. It makes me so sad they don't do the sword-pulling ceremony any more. The Sword and the Stone is my favorite Disney movie of all time. I watched it so much as a kid my parents tried to buy it from the video store, but that was back when VHS tapes were $80 and not something people owned at home. I never did get to pull out that sword!